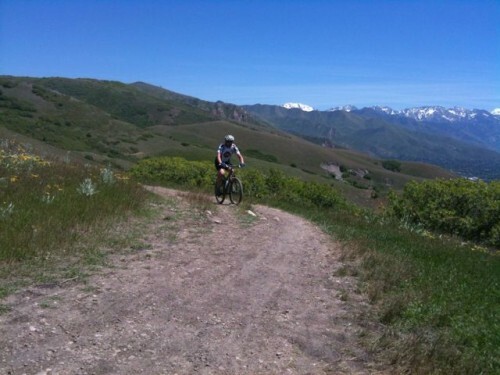 February 10, 2016 – The Bonneville Shoreline Trail in Davis County stands to benefit from an appropriation in the 2016 Utah state budget. On February 11, 2016, in the Natural Resources, Agriculture, and Environmental Quality Appropriations Subcommittee, there will be a hearing to determine if the $200,000 appropriation will stand. The appropriation would pay for construction and planning, including a NEPA study to determine the impact that the trail would have on Forest Service land. The committee meeting will be held on Thursday, February 11, 2016 at 8 am in room 210 of the Utah Senate Building (at the Utah State Capitol) and is open to the general public. Interested citizens can email comments to the committee members. When complete, the Bonneville Shoreline Trail will stretch 280 miles from Santaquin, Utah to Idaho. Yesterday morning Rep. Becky Edwards and Davis County Planning Director, Barry Burton went before the Natural Resources, Agriculture, and Environmental Quality Appropriations Subcommittee to request an appropriation for the Bonneville Shoreline Trail. The appropriation would pay for the required NEPA study for Davis County which is required before construction can happen on Forest Service land. This appropriation is very important as Davis County's entire annual trails budget is not sufficient to pay for the NEPA. There are many grants and funding sources that will pay for construction but it seems no one wants to pay for a study. The NEPA has been the primary obstacle to completion of the BST in Davis County. Once the NEPA is complete, trail construction can be tackled in small manageable chunks. Please act now as the committee votes tomorrow. Please take a minute right now to contact the members of this subcommittee to express your support for this project. If you live in the district of one of these lawmaker please let them know that you are a constituent. I have copied all of their email addresses below. One Response to "Action Alert – Bonneville Shoreline Trail Appropriation to be considered in Utah State Legislature on 2-11-16"